There are 4 photos in this posting and all are medium sized files. So, if you want to see details, please click on the pics and expand. 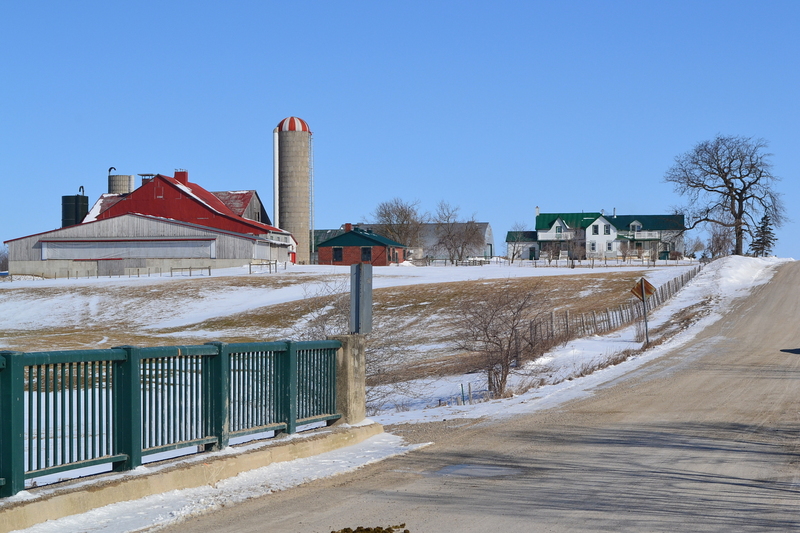 In and around Kitchener/Waterloo is a large community of Old Order Amish and their ‘mixed’ farms are a hold-out against the modern practice of ‘factory farms’. For that reason alone, I’m grateful to live among them. The produce from farms such as this provide much to my dinner table. You’ll notice that the houses are rambling. This is because when their children marry, they raise their families on the farm they grew up on and build onto the farmhouse to accommodate the growing numbers. 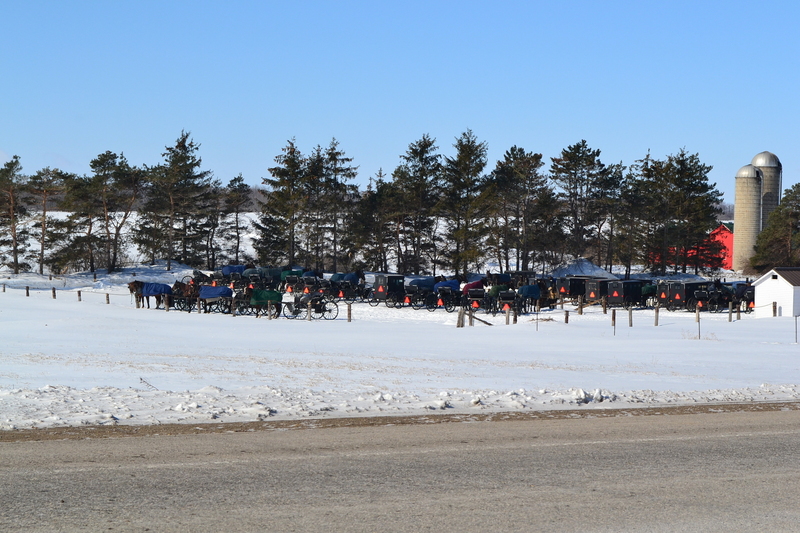 Every Sunday morning, they pack the family into buggies and head out for churches spread throughout the countryside. 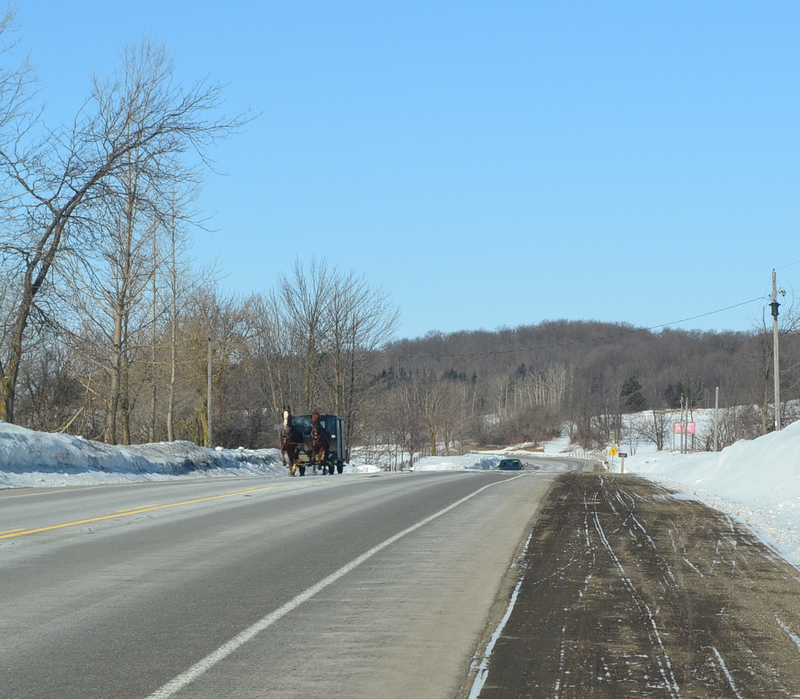 Sights like this are common on the roads any time of the week, even at night. For travel in the dark, buggies are equipped by lights that run off generators powered by the turning wheels and, during the day, large fluorescent red triangles are attached to the back. People get used to seeing these rigs on the roads, but still accidents do occur, which is sad. The churches themselves are very plain, but beautiful in their minimalist simplicity. There is nothing ‘showy’ about them at all, only clean, often white with green trim and totally functional. I admire that. Note the horses looking at me while I took their picture. 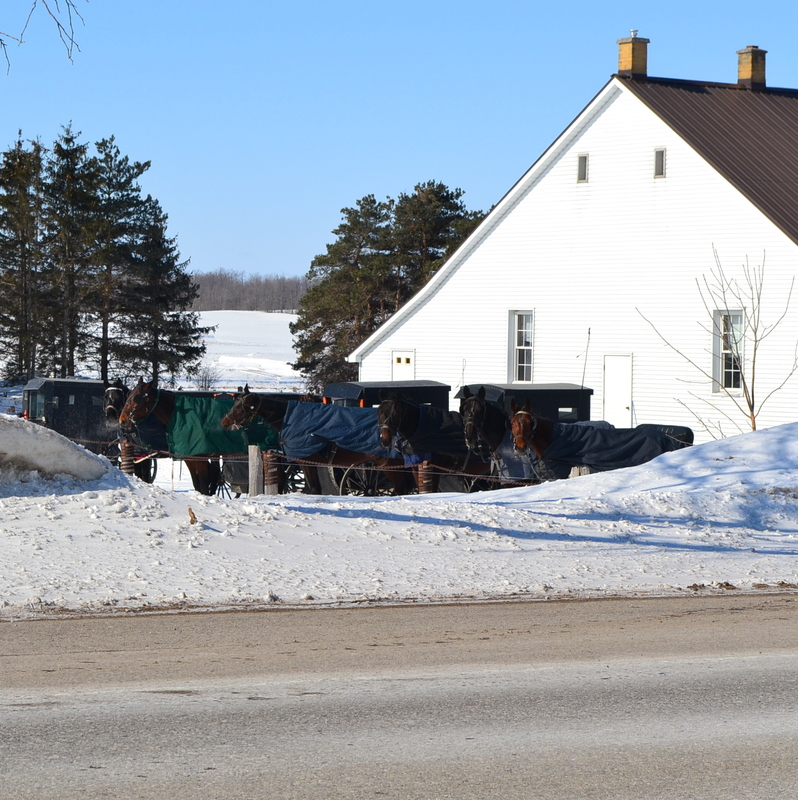 This entry was posted in Photography and tagged Amish, art, church, horses, Kitchener/Waterloo, Mennonite, Sunday. Bookmark the permalink. I enjoy your blog and drawings. Thanks for following my blog. Stark, simple, and clean. The attraction is evident… There’s an appeal to an aesthetic that derives from strong beliefs – it underscores each undertaking and shines through clearly, even if the beholder is not a part of it.